Fun With Fish Eyes, originally uploaded by Suarez. I had the pleasure of borrowing Tom Haymes’ new fisheye lens (AF DX Fisheye-Nikkor 10.5mm f/2.8G ED). 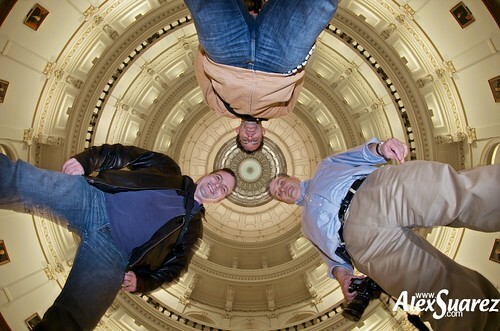 Since he was visiting Austin, we walked over to the Capitol rotunda (the only round room I could think of at the time) to have ourselves some fun. I went to high school with both of these gentlemen in the early 80s where we studied photography. Tom and I also were roommates in college for several years. It’s good to get back together with old friends. FYI--those portraits you see around the perimeter of the room are of former governors of Texas. Thanks Tom, for letting me use your lens. This is a very unflattering angle. It makes us look heavier than we are (we don’t need any help in that department) and it gives us double chins from looking down at the camera. I still think it’s a really fun shot. Going Home, originally uploaded by Suarez. Photographs ©2009 Alex Suárez. All rights reserved. 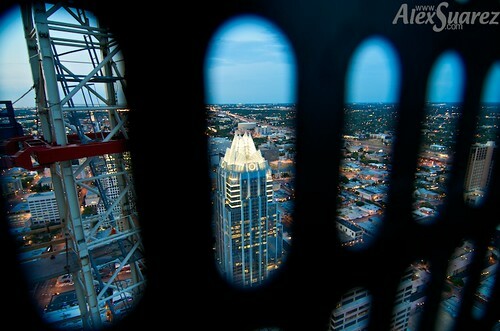 The Frost Tower as seen from the cage elevator descending down the side off of the crane from the top of The Austonian building in Austin, Texas the evening of September 8, 2009. The Austonian is a residential skyscraper currently under construction in Austin. Accoring to their blog, "standing tall at 683 feet upon completion, The Austonian will be the tallest residential building in the western United States." Special thanks to Flickr friend Steve Hopson and the good folks with The Austonian for hooking me up with this opportunity to shoot from the yet-to-be-finished $8M 54th floor penthouse. 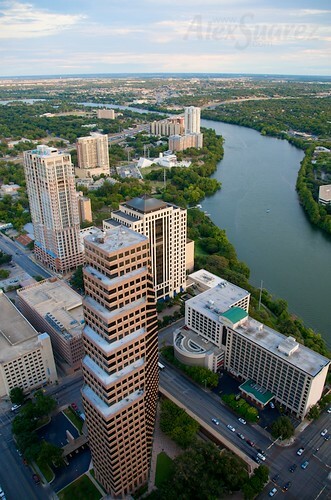 Ladybird Lake (formerly known as Town Lake) as seen from the Penthouse. BTW, that's a nearly 30 story skyscraper we are looking down on. 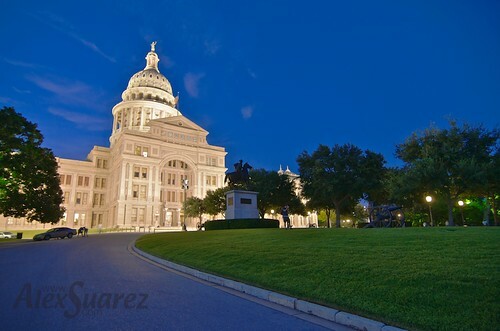 Texas Capitol, originally uploaded by Suarez. View of the Texas Capitol shot during Trey Ratcliff’s Sunset Photowalk in downtown Austin, Texas last night. 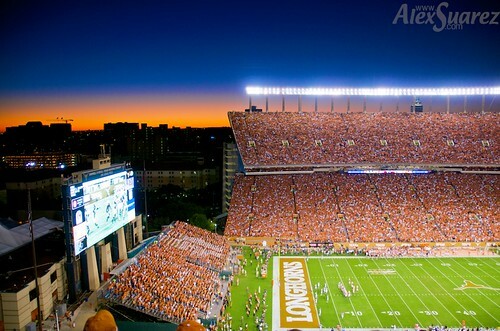 This is NOT an HDR image. It is a single image, not tone mapped in Photomatix. I had a great time. Met a lot of great photographers. Hope to see a lot of you at the next CapMac Advanced Photography SIG meeting.